Well here are the Potholders/Hotpads I been working on, I done 2 for each person so they will be getting one of each pattern, one is larger than the other if you like to see them larger click on picture & a new window with them in should open. These will be going to my swap partners one who in Cornwall (UK) the other set will be going to Ireland just hope they like them. 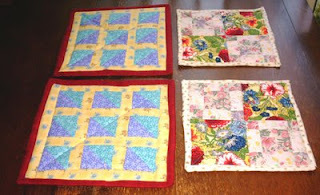 I am not sure what I will start on next have a list of things I want to do just depends on which I choose I do also have some blocks I need to do before I go to the quilting group have to remember to do them. While I was doing these everything going well until the binding I managed to break 2 needles & was having a lot of trouble but at least I finished them. I don't know which two I am getting, but they are all lovely. I really enjoyed reading your posts. and I will be following your blog. All the best! Thanks again for being my partner! PS: By the way, I love making socks too! You would be getting one of each i hope you will like them. Janice, we are nowhere near the box hahahaha, no its a nice straight forward one this time. Promise!